Measures approx. 17" tall by 10" wide. Easy instructions read as if I'm sittin' there with ya! 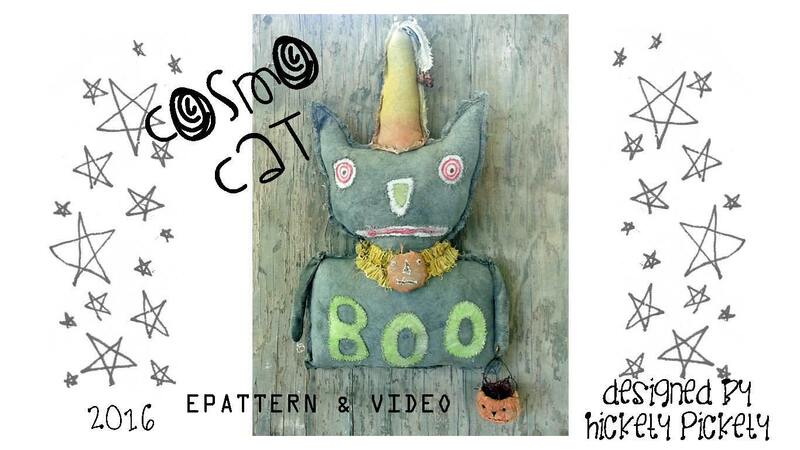 YOU ALSO CAN GO WATCH ME MAKE THIS CAT.... FROM THE SKETCHED IDEA, CHANGING MY MIND AS I GO ALONG... TO THE COMPLETED "COSMO CAT" IN THE END!!! Video is over 30 minutes long!!!! ALSO INCLUDED A VIDEO ON HOW I MAKE MY STAINING LIQUID!!! I'll tell ya exactly how to get your fabric primitives to look old! You can make as many as you can personally make for $$$$$....offer them on your website, on etsy, at shows, etc.....please do NOT resale the epattern though....Hickety Pickety owns all rights to the patterns. Ya'll have to have some kind of software that can download and print off the epattern...Acrobat Reader is free and is the most popular. If ya have any questions please email me. To check out other epatterns by Hickety Pickety click on the link below! To see all goodies I offer in my Hickety Pickety Etsy store...click below! What a cute and crazy kitty! Can't wait to try this Halloween cat pattern - he is unique and so cute. Am new to primitive style and this looks easy for an amateur like me to follow! Clear instructions are what I need. Thank you!